‘Chinese Puzzle’ is the final film in Cédric Klapisch’s travel trilogy (other films are ‘L’Auberge Espagnole’ (2001) and ‘Russian Dolls’ (2004)). The film presents Xavier (Romain Duris (‘Populaire’ (2012)), a French writer who leads a confused and stressful life in Paris. When his girlfriend of 10 years, Wendy (Kelly Reilly (‘Flight’ (2012)) leaves him for another man and moves to New York, Xavier follows her to the Big Apple to be closer to his children. In New York, Xavier’s adventures begin as he rekindles romance with his ex-girlfriend, Martine ( Audrey Tautou (‘Amélie’ (2001)), marries a Chinese-American to get a US green card and becomes a surrogate father to his lesbian friend, Isabelle (Cecile De France). ‘Chinese Puzzle’ is shot in the same style as the two previous movies in the trilogy, but this does not create problems watching the movie without having watched other films. The movie has interesting cultural references, including jokes about stereotypes and personal identities. From the vibrant portrayal of the NYC’s Chinatown life, where Xavier rents a flat, to French-specific allegories, ‘Chinese Puzzle’ takes an amusing look at globalisation. However, ‘Chinese Puzzle’ is also not so much a movie about cultural differences as a film about the complexities and pressures of a modern life. The main hero in the movie not only has to adapt to living in a different cultural setting, but also battles immigration authorities, pressures to find work, and a hectic life of being a separated partner/father. 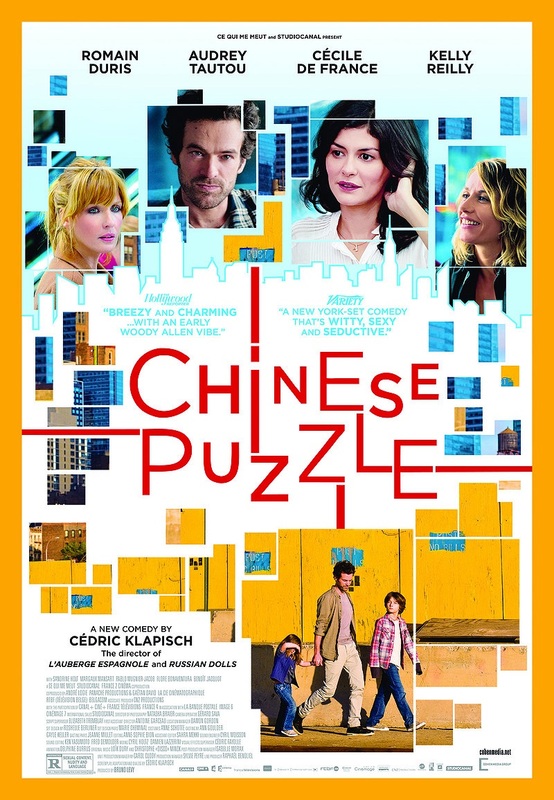 ‘Chinese Puzzle’ may not be as magical as ‘L’Auberge Espagnole’ or ‘Russian Dolls’, and may feel like watching grown-ups at a childish play, but it has its own way and very cleverly constructed comic moments, which will make the audience if not laugh, then definitely smile. For example, there is a funny scene where Xavier meets his ex-girlfriend’s new American boyfriend for the first time and pictures himself in a costume of a sixteenth century Frenchman, who has just arrived from the Old World, so misunderstood and out-of-place he feels. Even though many criticise the movie for being cliché and pretentious – there are indeed scenes in the film where Xavier “talks” to Schopenhauer and Hegel – these moments of “insanity”, ala Woody Allen, are not overly annoying and even fun to watch as our hero finds his existential roots in the maddening world around him. The music and generally great soundtrack certainly help along the way: there is a great, nostalgic song “If I had my way” by Kraked Units, and even Bach’s Goldberg Variations are thrown in to top it all. Another permeating theme throughout the movie is, of course, New York and the pursuit of the American Dream, as Xavier settles in to find his place in the land of freedom, being hired to work as a mail delivery man, and having squabbles with his ignorant and unpredictable lawyer. In fact, New York is presented as almost like another character in ‘Chinese Puzzle’, accentuating city’s cultural diversity, coffee on-the-go and busy streets filled with yellow taxis and skyscrapers. The cast does a great job in this film. Romain Duris is as charming here as ever, mingling with three ladies who seem to represent different stereotypical characters and behaviours: (i) a moody, wimpy and confused Wendy; (ii) wanting to change the world at whatever cost Martine; and (iii) lusty homosexual Isabelle. Although the emotional inputs and outputs between characters are lukewarm at best, their chemistry is nevertheless great, and each character in the movie is likeable in his or her own unique and odd way. The weakest point in the film comes when Xavier gets to meet his father, who once also loved and lived in New York. This father-son sequence is completely needless in the movie, and not only confuses, but also irritates, as the audience does not get to find out anything particularly important, and the father’s dialogue and disinterested and cynical attitude leaves this otherwise comic and light-hearted movie in some kind of a horrid distress. Another drawback may be that ‘Chinese Puzzle’s narrative flows as Xavier recalls his life backwards and this makes the movie unnecessarily confusing given the already rapid intertwined turns of events. Coupled with this is the completely unrealistic portrayal of some of the events in the film, such as Xavier getting work “illegally”, marrying “illegally” and staying in the US “illegally”, when, in fact, if his children are allowed to live in the country, why should it be that difficult for him? However, the movie’s culmination, a so-called “climax” compensates for all the negativity. The ending represents the point where all the story lines in the film come together and there is a danger of Xavier’s secrets being spilled out all at the same time. It is worth watching a movie just for this hilarious ending sequence. Light, funny, sweet, enjoyable; and starring Cecile de France and Audrey Tautou? Sold.